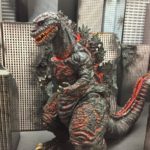 2016’s Shin Godzilla brought the King of Monsters back in glorious fashion, and now Bandai Tamashii Nations have revealed a brand new variant of the film’s Godzilla design in figure form! S.H. 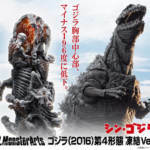 MonsterArts Shin Godzilla 4th Form Freeze Ver. is based upon the monster’s “defeat” at the end of the movie, where Godzilla is successfully frozen by Japan’s plan to inject gallons of coagulant into its mouth. Though a primarily a repaint of the original Shin Godzilla, Freeze Ver features a brand new, highly detailed tail piece including the humanoid Godzilla creatures emerging from it in the film’s final scenes. The figure is Tamashii web exclusive release and includes no additional accessories, retailing for 14,040 yen and releasing in July 2018. Check out the full selection of images and discuss the figure after the jump! Tamashii Nations 2016 has gotten well under way and to make things easier we’ve separated our coverage into multiple posts. Continuing our coverage, while there isn’t much to report yet, a small selection S.H. 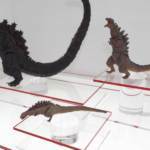 Monserarts figures is on display from the recent Shin Godzilla film. The display includes of course the standard final form S.H. Monsterarts Shin Godzilla, but also the younger 2nd & 3rd forms of this behemoth. We’ll keep you up to date throughout the weekend as more images and info from Tamashii Nations 2016 begin to circulate. Stay tuned to TokuNation!